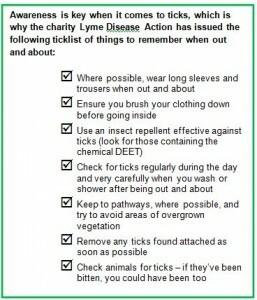 With the topic for this year’s World Health Day (7 April) being vector-borne diseases and with spring on the horizon – ticks peak in population from April to October – charity Lyme Disease Action clears up some of the most common misconceptions surrounding Lyme disease, and issues a useful ticklist of things to remember to be Lyme-aware. Do ticks exist in central London and other cities? Surely I have to be somewhere rural to be at risk? Lyme disease is found across the UK, in city parks (such as Richmond Park in suburban London) as well as in rural areas; you can be just about anywhere in the UK and a tick can latch on to you. The hedgehog tick and fox tick also carry and transmit Lyme disease so, wherever there are hedgehogs or foxes, there is a risk of Lyme disease: in overgrown urban gardens and town parks alike. Birds can also carry ticks. This all sounds a bit dramatic – I’ve heard of ticks, but is it something that I really need to be concerned about? There’s no need to be afraid – it’s more a case of being aware; knowing how to reduce the chances of being bitten, how to remove a tick and knowing what to look out for in the way of symptoms. We do know, however, that the number of confirmed cases of Lyme disease is on the rise. The reason for the increase can’t be pinpointed exactly, but factors may include an increase in the UK’s deer population, damper summers, milder winters, higher recreational use of parks and countryside and a modest increase in awareness of the disease. So, what should I do if I am bitten? How should I remove a tick? I’ve heard people talk about using Vaseline or burning them off. Burning a tick off, squashing it with your fingers or smothering it in Vaseline or lemon juice is totally the wrong way to handle tick removal. Irritants such as these may cause the tick to regurgitate the contents of its stomach into the bloodstream of the person on whom it is feeding – increasing the chance of infection. Instead, ticks should be removed as quickly as possible with a tick removal tool. If you don’t have a tick removal tool, use a thread of cotton wound round close to the skin and pull upwards or, alternatively, cut a slit in a plastic card and slide that under the tick’s body. If you have been bitten by a tick and notice any of the symptoms below, seek medical help straight away. Diagnosed and treated early, Lyme disease can be treated successfully with antibiotics. Does everyone with Lyme disease get a rash? Contrary to popular belief, not everyone who is bitten by an infected tick will get the text-book circular red ‘bull’s eye’ rash – surveys have shown that around one in three do not see a rash. Other symptoms include headaches, a stiff neck, extreme fatigue, muscle and joint pain, and disturbances of sight, hearing, digestive system and sleep. If left untreated it can progress to the joints, the heart and the nervous system. No. There have been few studies in the UK, but those that have analysed tick infection rates have found between 2% and 17% of ticks to carry Lyme disease. This is why awareness of Lyme disease is so vital, as people need to know what symptoms to look out for. Will I know if I’ve been bitten? Not necessarily. Ticks are tiny – the size of a fullstop on this page – and, because they inject their host with an anaesthetic, their bite does not cause irritation and can easily go undetected. UK studies report that about one in three people do not notice a tick bite and, as tick bites do not itch like mosquito bites, awareness is important to aid diagnosis. A Lyme disease poster, showing how to remove a tick correctly, and leaflets on Lyme disease, are available for publication if required or, free of charge, for readers to take to their own local GP or veterinary practice. A fact sheet is also available on request. 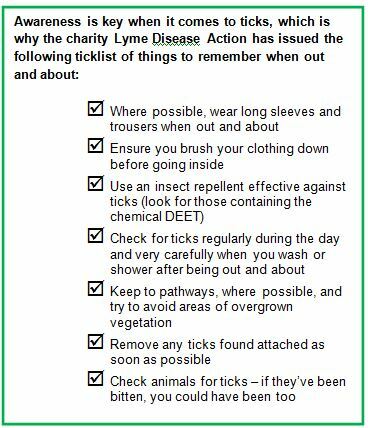 Tick removers can be ordered via the Lyme Disease Action website (www.lymediseaseaction.org.uk) and cost from £4.99 including p&p. For more information, case studies or to speak to Stella Huyshe-Shires, the Chair of Lyme Disease Action, please contact Sue Ockwell or Helena Hamlyn via email press@lymediseaseaction.org.uk .